Anxiety is a condition that presents itself on a long continuum, both in humans and our furry companions. It can rear its worrisome head in reaction to a specific event, like a thunderstorm, or it can be a more general condition, almost always lurking beneath the surface. Anxiety can express itself in a severe way with aggression, depression, and destructive behavior or it can present with sometimes misunderstood behaviors like accidents in the house, excessive barking, or drooling. 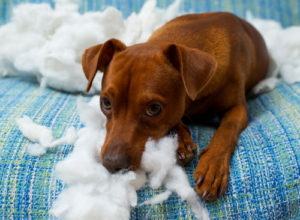 Whatever the cause and expression of your pup’s anxiety, finding relief is a sometimes tricky process of trial and error. If you wish to avoid pharmaceuticals, you will need to try a variety of therapies to find those that work for your dog’s specific anxieties. Consult with your veterinarian before you use any treatments on your pup – natural or otherwise. One or a combination of several of these 11 natural remedies may help ease symptoms and get you both feeling more safe and secure. Essential oil diffusers are a safer way to administer these potent plant extracts to your dog and reap the time honored benefits of their use. For anxiety, try diffusing lavender or frankincense. If you’ve got a mind to mix it up, try a peace promoting combination of orange, tangerine, ylang ylang, blue tansy, and patchouli. Please note that many essential oils are not safe for direct application to dogs, so consult a holistic veterinarian if you’d like to further explore essential oil therapies for your dog. If your dog suffers from storm anxiety, it can be ruinous to the household’s sleep and dangerous for your panic-stricken dog. The Thundershirt wraps your dog in a firm hug, bringing a sense of calm to the parasympathetic nervous system. It has been successful in treating even very severe cases of weather-related anxiety. If you’re more of a DIY’er, you can make your own version at home, called a Half Wrap, with an ace bandage or scarf. In either case, limit use of the wrap to high anxiety times. Using it too frequently can lessen efficacy. Being close to your scent can help dogs who suffer from separation anxiety. The Comfort Cuddler is designed especially for that purpose. Simply stuff it with a used shirt, pillow case, or other soft item that has your scent and your dog can cuddle up to it when you are apart. The best part? We donate a toy to a shelter in need with every purchase of the Comfort Cuddler. Hemp oil has been used successfully in humans and dogs to ease the symptoms of anxiety. It’s important to choose a full spectrum oil in order see benefits. Full spectrum oils contain ingredients from the seeds, stems, and leaves of the hemp plant. All three are necessary to see therapeutic benefits. 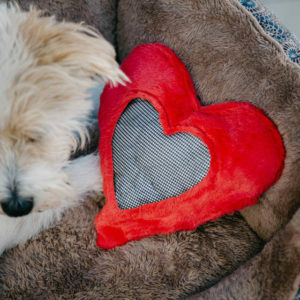 Discover what causes your pup to feel separation anxiety! Chinese medicine says that anxiety results as an imbalance between the kidneys, a water element, and the heart, a fire element. Specially selected combinations of herbs can work together to put these elements back in harmony and as a result, return peace and calm to your dog. Although there are herbal tinctures commercially available that are safe to try, a consultation with a Certified Traditional Chinese Veterinary Medicine Practitioner is ideal. She can help you determine which combination of herbs will be best for your dog’s particular situation. There are tons of choices available when it comes to calming treats for your anxious companion. These treats contain ingredients that promote relaxation, such as melatonin and tryptophan. Best thing about these is that they are tasty and super easy to administer to your fur baby. This solution is perfect for the pup that has situational anxiety. If car rides or visits to the park get your pup worked up, try hanging an essential oil diffusing locket from her collar. You can also rub the oils into the pads of your pup’s feet for absorption into the body. Make sure they are certified as safe for topical use in dogs. The flowers of the chamomile plant calm the mind, body, and digestive system. You can safely give your pup chamomile tea right in his water dish. When a puppy nurses is is a naturally calming and satisfying experience because his mother emits pheromones. Thanks to science, these chemicals can be mimicked and be used to create an inviting environment for your agitated pup. Spray down the kennel, car, bed, collar or room ahead of time and let your dog enjoy the serenity. For a fast acting solution to separation anxiety, add drops of pasque flower tincture to your dog’s daily water. It targets destructive behavior by calming the nervous system. Kava Kava is an herb traditionally used in Polynesian culture. It is safe for use in dogs to treat general anxiety but is especially effective for dogs that are restless. Add the tincture or powder form to food or water. When your dog is shaking, drooling, pacing, or in full panic mode it can lead to destruction, injury, and frustration. 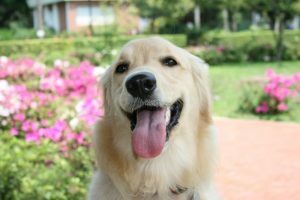 Anxiety is a common problem in dogs but with a concerted effort to find a solution that works for your dog’s particular situation and body, relief can be found naturally. As we mentioned, always talk with your veterinarian prior to any treatments for your pup – even when the remedies are all natural.